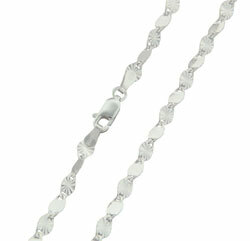 This is an Italian twisted mirror sterling silver chain necklace. One side of the link is flat mirror look while the other side is a diamond cut/starburst pattern to catch the light at all angles and reflect it. This is absolutely beautiful look that will change with the lighting and position of the viewer. Italian jewelry manufacturers are well-renowned for their exquisite design and fine craftsmanship. 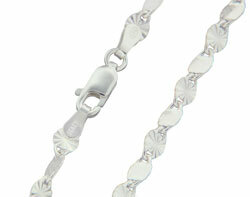 The solid sterling silver chain is stamped 925 and Italy so you can be assured of the style, quality and craftsmanship. This comes with a sturdy lobster claw clasp for security and ease of use. It is available in 16, 18, 20 and 22 inch lengths.